The tour has been designed carefully to give you an insight of the Wild India: Satpura, Pench & Kanha form the Rudyard’s Kippling country, offering beautiful scenic views, mesmerizing rivers, and Bandhavgarh offering the finest Tiger Sightings. The Tour will take you from the ravine’s of Satpura to the Lush green Meadows of Kanha to the Deciduous forests of Pench & Bandhavgarh. Kings Lodge is nestled between Sal forested hills of Bandhavgarh National Park in a large natural forested estate of 14 hectares in a small tribal village. Kings lodge is environmentally sensitive, harmonious with the natural features of the site and accentuates natural daylight to all facilities. Local knowledge and art has been incorporated in the development and the lodge has been constructed using local manpower. Our guests benefit from our incredible location, outstanding hospitality, an experienced naturalist team, our commitment towards conservation and local communities. 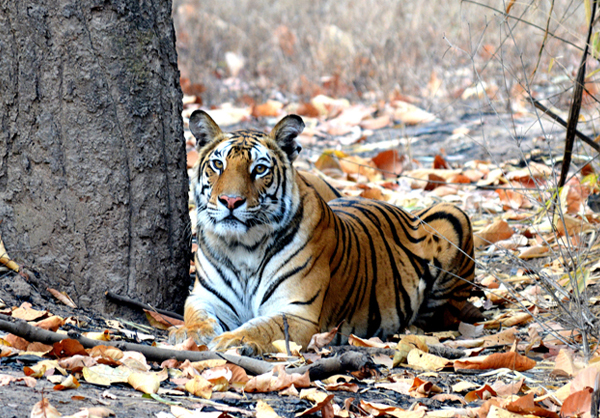 Bandhavgarh was established in 1968 as a National Park, and is spread over an area of 448 sq. kms. This national park was declared as a tiger reserve under Project Tiger in the year 1993. It is predominantly covered with vegetation like SAL, SALI, DHOBIN and has vast stretches of grasslands spread over 32 hills, the region though smaller than other wildlife parks has one of the highest density of tigers in the world. Day 03: Satpura National Park Morning boat safari Afternoon walking safari in Satpura Tiger Reserve. Late evening jeep safari in the buffer zone to spot nocturnal wildlife..
Post Breakfast drive to Pench National Park (5 Hours). Lunch on arrival at Pench Tree lodge. Evening spend time in the in house organic vegetable & herb garden. Day 07: Pench - Kanha National Park Early breakfast followed by transfer to Kanha National Park (3 hours). Lunch on arrival at the lodge. Evening village walk. Day 10: Kanha – Bandhavgarh National Park Post Breakfast, transfer to Bandhavgarh National Park (260 Kms, approx 5 hrs). Lunch on arrival at Kings Lodge. Evening at leisure followed by an early Dinner. Day 11: Bandhavgarh National Park Morning and evening jeep safari in Bandhavgarh Tiger Reserve. Day13: Bandhavgarh National Park Post breakfast, checkout for further connections. Tour cost: USD 2565 per person on twin sharing.